The 2019 Seedling Tree Sale Program has ended. We will begin selling trees again in November 2019. For those who purchased trees, they will arrive in Gillette on May 2, 2019. Many areas of Wyoming receive limited precipitation during the fall. Even though leaves have fallen from trees and shrubs, there is still active growth belowground. Roots continue to grow in soils during the fall as long as the soil temperature is above 40 degrees F and there is adequate soil moisture. A good soaking of the entire root system in late fall will help ensure better establishment of new trees and shrubs and is especially important for evergreens. This can be from late October to late November depending on where you live in Wyoming. Provide trees and shrubs a slow and thorough soaking that wets the root system to at least 12 inches below the ground surface. A general rule is to provide 10 gallons of water for every 1 inch of trunk diameter. 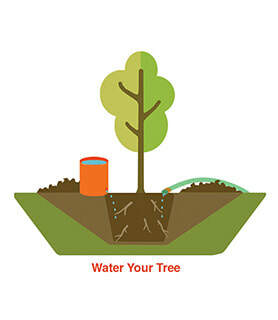 For example, a 2-inch diameter tree will need 20 gallons per watering. This is best accomplished by a deep root watering probe attached to a hose or by rotating a hose with slow running water over several areas of the root system. Soaker hoses also work well when placed over the entire root zone. An insulating layer of pine needles, leaves, and small branches called duff covers a natural forest floor. This natural layer can be mimicked to help your landscape trees stay healthy. A 2- to 3-inch layer of organic mulch like bark or wood chips over the root system will help preserve moisture and aid in keeping the soil temperature warmer in the fall, thus prolonging good conditions for root growth. Mulch also helps moderate the soil temperature during winter and prevent frost heaving of the upper roots caused by repeated freezing and thawing of soil water. Ideally, the mulch should extend to the outer edge of the branches but be kept 6 inches away from the trunk to discourage gnawing by rodents. This will also help prevent rot caused by excessive moisture next to the trunk of the tree. Woven fabric weed barrier will also help retain moisture and control weeds. This is commonly used to establish seedling trees in windbreaks. Winter wind causes excessive transpiration (foliage water loss) of evergreens while the roots are in frozen soil and unable to replace lost water. This results in desiccation (drying out) and browning of the needles. Small evergreens can be protected by placing a barrier of burlap, canvas, or similar materials on the windward side of an individual tree. These barriers will also catch snow for natural wind protection and moisture. Many local conservation districts in Wyoming have tree protectors available for small seedlings. Sprays to reduce transpiration are another option that can be used to prevent drying of foliage on evergreens. These are waxy coatings applied in late fall to prevent moisture loss from needles. Some common brands such as Wilt-Pruf and TransFilm can be purchased at garden centers and hardware stores. Junipers and other conical-shaped evergreens have rigid, ascending branches. Heavy, wet snow can cause them to bend, crack, or split from the main trunk. To help prevent this, the tree branches can be wrapped with twine to streamline their shape and keep snow from building up. Proper pruning, to eliminate weak branch attachments on shade trees, will also reduce snow damage. Very narrow branch angles are prone to breakage from heavy snow loads. For strength, the ideal branching angle approximates 10 or 2 o’clock. Fall pruning should be done after leaf drop on non-junipers and when trees are dormant. The trunks of young, thin-barked trees can be injured in winter by sudden temperature changes. Sunscald occurs in midwinter when direct sun rays heat the south and southwest sides of tree trunks. This raises the temperatures above freezing and causes some cells to become active. After sunset or with changing weather conditions, the cells experience a sudden temperature drop, which can kill the activated tissue and result in cracks on the trunk. Commercial tree wraps or plastic trunk guards, available at garden centers and hardware stores, can prevent sunscald injury. They can be placed on the tree in late fall but should be removed in spring. Young trees that have not yet developed a coarse textured bark should also be protected from hungry wildlife during winter months. To prevent gnawing by rodents and rabbits, place trunk guards or a cylinder of ¼-inch mesh hardware cloth around the trunk. Much sturdier fencing is required to prevent rubbing by deer. You can learn more about this subject by visiting the Barnyards & Backyards “Resources” page at www.barnyardsandbackyards.com. Winter injury to trees and shrubs is a common problem during Wyoming winters. Appropriate plant selection, proper cultural practices, and some preventative maintenance will significantly reduce severe injury and help result in a healthy flush of new growth next spring. The Wyoming State Forestry Devision has developed an Owner's Manual for trees with great information for planting, care and maintenance of trees in Wyoming. Web Soil Survey provides a simple yet powerful way to analyze soil data in four basic steps. To research tree suitability for your planting site open the following link: http://websoilsurvey.nrcs.usda.gov. Click the "Start WSS" button to begin.